A bachelor's degree in education will prepare you for a job as an elementary or secondary school teacher. What should you do, however, if, after completing your degree you decide you don't want to teach children after all. Or maybe you've spent years in the classroom and want to change careers. Perhaps the choice wasn't even yours. Abandoning the profession may be your only viable option if can't get a job in a school or were laid off due to shrinking school budgets. Your teacher's salary may be too low or you may have to use too much of it to buy classroom supplies for your students. Fortunately, your training as an education major prepared you for other careers. Here's a look at several options. Some of these occupations may require additional training or even an advanced degree. Librarians work in public, academic, law, medical, and business libraries. Many have jobs in elementary and secondary school media centers. 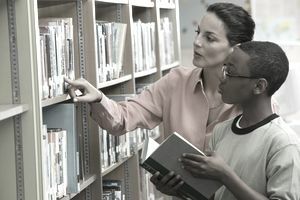 Librarians select and organize materials including print and electronic resources and instruct students and patrons in their use. You will need a Master's Degree in Library Science (M.L.S.) if you want to become a librarian. A bachelor's degree, such as your degree in education, is required for admission to graduate school. Once enrolled in a library science program, you may want to specialize in school media since it would be a good fit for your background in education. Some states require school media specialists, commonly called school librarians, to also be certified teachers. If you would prefer to not work in a school, or with children for that matter, you should choose another specialty. Consider law, medical, or business librarianship, but definitely stay away from public libraries. Writers create material for print and online media while editors select what content to publish and provide feedback about it. To be a writer, you must be able to express yourself well verbally. Editors must know how to guide writers by explaining assignments and giving constructive criticism. Your skills as a trained educator will help you succeed in both these occupations. You know how to convey complex information and are adept at delivering feedback. You are also creative—how else do you find a million and one ways to effectively explain the same concept to different students. If you teach, have taught, or have training in a particular subject, for example, science or history, you can specialize in that topic as a writer or editor. You may have done quite a bit of writing while in college or graduate school, but give serious thought to taking some professional writing classes anyway. They will help you perfect your skills. Managers supervise other workers in a variety of occupations. Not everyone is cut out for this career, but those who are must be good at delegating work to others, assessing performance, giving constructive feedback, setting one's personal feeling aside when making decisions, and saying no when necessary. Sounds like the job description of a teacher! Unless you want to go back to school to study management, look for jobs that don't require a degree in this subject. While managers often need a bachelor's degree, it may not have to be in a particular major. Anyone who has ever tried to persuade a child to do anything he or she doesn't want to do can verify that it isn't an easy task. Yet teachers do that every day. They must be very persuasive, maybe even as much as a salesperson. Combine this skill with your expertise as an educator to sell textbooks and instructional materials. Education majors and teachers can even utilize their subject knowledge to sell some products. Additionally, experienced teachers know how school systems function and can use this to their advantage. One of the most valuable skills sales reps need is the ability to establish rapport with their customers. It is unlikely this will be a problem given the common background you would share with yours. There are no formal educational requirements for this career, although some employers prefer job candidates who have a bachelor's degree. You meet that stipulation. Do you enjoy working with kids but have had enough of being in a classroom? A career in school guidance could be a good option. Guidance counselors assist students with any school-related issues they have including selecting classes, dealing with academic difficulties and social problems, and applying to college. A bachelor's degree in education, especially if you followed it with a stint working in a school, will provide an excellent background for this occupation. You will also need to earn a master's degree in school counseling. Instructional coordinators develop curricula for school systems and help teachers develop new strategies and techniques. This career is good for someone who wants to continue to impact children's education but prefers to not have direct contact with them. All employers require a master's degree in curriculum and instruction, or a related field of study. You will also need to have either a teaching license or an education administrator license, depending on the requirements in your state. Training and development specialists design and implement instructional programs for companies' employees. Training and development managers, who oversee them, plan, coordinate, and direct these programs. Their goal is to improve workers' skills and knowledge and, in turn, performance. As a teacher or as someone who has trained to become one, your ability to provide instruction and determine teaching strategies that are appropriate for different situations and subjects are very beneficial in this occupation. Excellent communication and time management skills honed during your time in a classroom can also help you succeed. Most jobs require a bachelor's degree, but some employers will only hire candidates who have a master's degree. You may want to beef up your background by taking some business classes as well as courses in instructional design. Instructional designers develop technology-based courses and other educational products. They help faculty incorporate instructional technology into their classes. Instructional designers often develop distance learning courses like those found on Udemy. While your training provides you with the ability to instruct others, you must also have experience working with technology in the classroom. You will need to learn how to apply your skills as an educator to the development of technology-based educational programs. Look for certificate programs or master's degree and doctoral programs in instructional design. Health educators teach people how to live healthy lifestyles. They work in elementary, middle, and high schools but if you no longer plan to work in that environment, there are also jobs in health care facilities. Your ability to provide instruction and proven interpersonal, verbal communication, and listening skills make a good foundation for having a successful career as a health educator. Now all you need to do is learn about public health, which you can accomplish by earning a master's degree in community, public, or school health education. Although teaching children is not part of your future plans, it doesn't necessarily mean you don't want to continue to be an educator. Adults whose plans include earning a GED (General Educational Development) also need qualified teachers to instruct them in basic reading, writing, and math skills. People who are new to the United States need individuals to teach them fundamental English language skills. Licensing requirements for ESL (English As a Second Language), adult literacy, or GED teachers vary by state. Some require, at the minimum, a bachelor's degree in education while in others a master's degree iks mandatory.